The table of a magnetic resonance tomograph (MRT) for 3D scans is to be positioned precisely in order to be able to correctly assign the pictures to each position. A reference run is not possible as this would cause a considerable delay after switching on the MRT. To be able to guarantee a precise positioning of the MRT table, a table with different body heights and the approximate positions or measurement areas of the different parts of the body is created. When a person is lying on the MRT table, the position of the body part to be scanned is detected on the basis of the body height table. 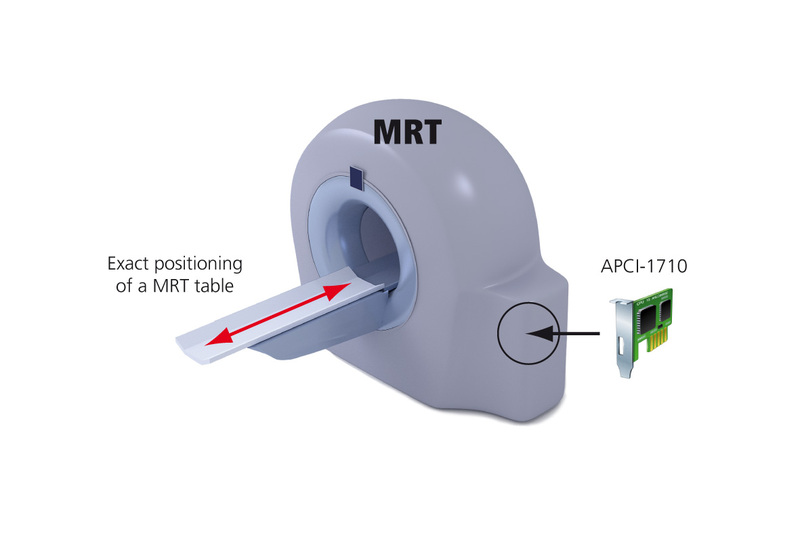 The movement of the axis is carried out by the APCI-1710 with SSI encoder connection (6 encoders for the MRT table) and PWM (control of electromagnetic valves for the cooling of the magnets with nitrogen). Then the scan process is started. Through the predefined speed the APCI-1710 detects the position for the end of the scan process. Manual corrections of the positions at the beginning and the end of the scan result from the “target / actual situation”. The high precision of the positioning allows an exact assignment of the scanned pictures. The motors for the movement of the MRT table are controlled through the digital I/O of the board.